Located in eastern North Carolina along the banks of the Roanoke River, Martin County is small and rural. The population in the 2010 U.S. Census was 24,505, a slight decline from 2000. Its county seat is Williamston. 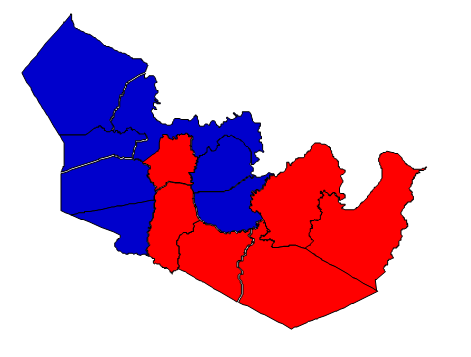 Historically, Martin was one of the strongest Democratic counties in North Carolina. Although there has always been a substantial black population residing in the county, many of them were unable to vote, and black voter registration in Martin lagged behind the rest of the state. Gradually, however, many whites drifted over to the increasingly conservative Republican Party. The county remains racially polarized, with whites voting Republican and blacks voting Democrat. Even though whites make up a majority of the voting age population, the high black population is a difficult hurdle for a Republican victory in the county. Forecast: African Americans are leaving the county at a rate higher than the county average, and whites constitute an even higher percentage of the population in 2010 than they did in 2000. Despite this unfavorable demographic trend, the Obama campaign operation registered significant numbers of black Democrats, leading to two consecutive Democratic victories at the presidential level. In fact, Obama did better here in 2012 than he did in 2008, thanks to the increased registration of African Americans. The question for Democrats is whether or not this turnout is likely to be replicated in the future. At this point, the answer seems to be: no, but a return to pre-2008 of black turnout is also unlikely. Thus, chances for Republican victory hinge on a persistence of African American outmigration throughout the decade. If these trends continue throughout the decade, Martin has a decent chance of going for a Republican, as it did for George W. Bush in 2004. But if not, then Martin remains too Democratic and too inelastic to offer much hope of victory. Notably, Elaine Marshall did better here than Obama, which means that a more traditional Democrat may do better with the county’s white voters. In the end, the Obama registration effort was key and in this case trumped rather than accelerated demographic reality.